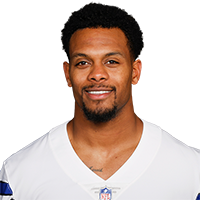 The Cowboys activated Goodwin (forearm) from injured reserve Monday, Brandon George of The Dallas Morning News reports. Analysis: The Cowboys waited until the final week of the regular season to bring Goodwin back to their active roster. The 28-year-old now rejoins Dallas' secondary just in time for the team's postseason push, and he's expected to serve in a depth role going forward. Goodwin (forearm) will begin the three-week practice window Wednesday with eyes on potentially rejoining the 53-man roster late in the season, Brandon George of The Dallas Morning News reports. Analysis: With one available return from IR spot remaining, the Cowboys have decided to take a look at adding some help in the secondary late in the season. If he returns, Goodwin should provide some depth at the position in addition to contributing on special teams. 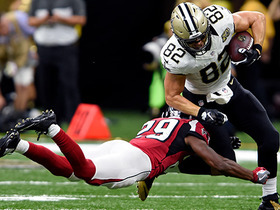 New Orleans Saints QB Drew Brees completes a pass to tight end Coby Fleener for 24 yards.